Q: I know that you guys volunteer at races throughout the area, getting up early on the weekend isn’t for everyone, what drives your efforts? Runners get up early on the weekends to get their long runs in, so getting up early to volunteer at a race isn’t that much different. As a runner, you appreciate the cheerful, smiling people who pass out water and sports drink to you during a race, so sometimes you need to be there for other runners. 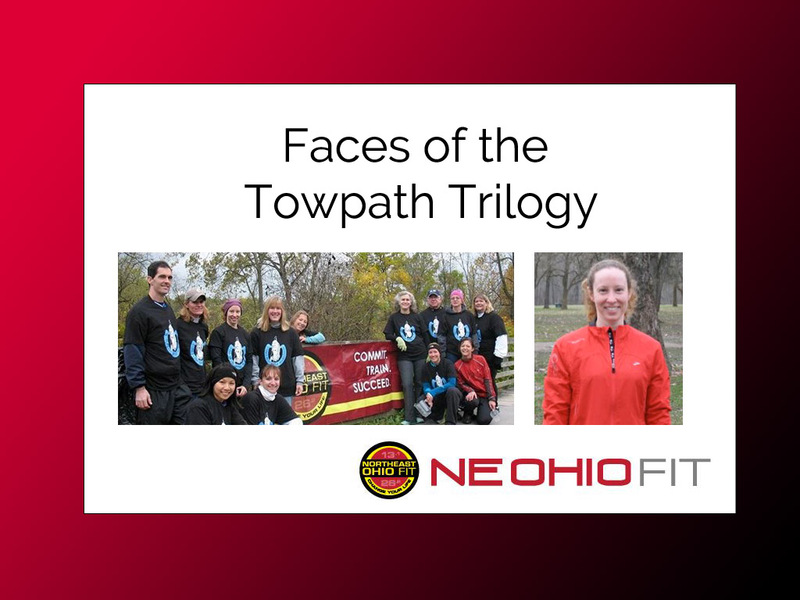 In a race series like the Towpath Trilogy, it feels even better because you are helping to support a group that builds and protects the towpath. I think there are a lot of people who are not aware of what an asset the towpath is for outdoor exercise, either walking, running, or biking. Not to mention the site seeing of birds, animals and the river. Q: Sounds like a cool program, so do you ever stray from Northeast Ohio for races? Do you have a “bucket list” race you’d like to complete some day? Northeast Ohio Fit trains for local races, but the training program can be adapted to another fall marathon or half marathon event. Because of the strong running community in this area, there are a lot of races. This allows runners to sleep in their own bed the night before a big race and travel a short distance before running a marathon or half marathon. Destination races are fun too, but sometimes can be expensive. Running is not a job or primary focus for most runners, it is a fun, social activity, and local races allow us to run more races with less travel. I am always surprised to meeting runners at the Towpath marathon who have traveled so far to run the race. They come because of the amazing towpath and the beautiful October weather. We are spoiled in that we can run on the towpath any time we want, so it doesn’t feel that special to us. Viewing it from traveling runner’s perspective, it makes me appreciate what we have even more. I haven’t run the Towpath Marathon because I have been volunteering the last several years, so perhaps it needs to be on my bucket list! Q: Any tips out there for someone who is maybe just getting started running? Running can be a great metaphor for life – you get out what you put in. It can be hard and difficult, but yet so rewarding. Running gives you the opportunity to learn about your body, teaches you how to deal with aches and pains, teaches you how to push past your comfort zone, and how to set goals and achieve them. Or running can be your stress management program and helps you clear your mind and relax your body. All you really need is a good pair of running shoes! For those who are just starting running, my advice is to not over do it, go slow and build your mileage slowly. Your body has to adjust to the pounding that comes from running and it takes your bones a while to adjust. If you over do it too soon, you may end up with a running related injury. A training program like Northeast Ohio Fit creates a manageable schedule for everyday working people to follow. And our program is partnered with Vertical Runner, a dedicated, local running store, where together we can provide everything a runner needs to be successful. Finding other people to run with can make a long run seem short and fun! Running can be extremely social, and if you find the right group of people it will help you stay focused on your goals, push your boundaries to new limits (meaning you can do more than you think you can), and open you up a new world of people you wouldn’t normally hang around. Next The Towpath Trilogy Now Offers Free CORE Nutrition Planning.